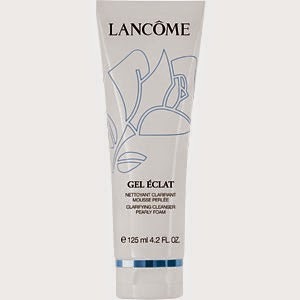 This Friday I'm in love with the Lancôme Gel Éclat Clarifying Cleanser. The is the best cleanser I've ever had the pleasure of using. I'm sitting here trying to think of adjectives worthy enough, let's just say I'm impressed. Let's start with the texture; it's a pearly white gel that transforms into a luxurious milky foam of tiny foam bubbles. Only an itty bitty pea size squidge is required, which you froth up in your hands before smoothing it in a circular motion on your face. It's so fine that it gets right into the pores of your skin to lift away impurities and excess oil. It is excellent at removing (a normal amount of) make up as well and my skin actually squeaks while using this in the shower, and rinses to reveal beautiful skin. There's a great comfort in knowing that your skin is as it should be - utterly cleansed, smooth and soft. No residue, no dry stripped feeling, just your skin in its happiest state. Scent-wise, yes like most things Lancôme, it is quite fragranced but the smell is fresh and floral and I like it. It contains white lotus and rose and is packed with anti-oxidants. According to Le Blurb, it's suitable for normal and combination skin, however based on my own skin and experience, I would imagine that oilier folk would benefit from this, but I feel that it may be a bit too harsh on particularly dry skin. My own skin has been shifting back and forth somewhat lately (what with the days becoming a little more wintery and the heating being blasted to keep the childers warm), and this cleanser hasn't let me down yet, in fact my face loves it. There's always a caveat. I just wish that it was suitable to use on the eye area, but holy jayzus, it burnnnnns. A couple of times it has sneaked its way into an eye, only for aforementioned eye to flare up red and sore. Really red and sore. Ouch. I know that some people have used it to remove mascara and I honestly. don't. know. how. they. manage it. Even Lancôme themselves recommend that you rinse your eyes immediately should this stuff come into contact with them. Price-wise, this is a little on the spendy side for me at €26 (for 125ml), but as I said, you really only use the tiniest bit of this at a time. I've had mine for months; I use it most days and there's still loads left. To be honest the price tag would have turned me off even considering it. However I gladly accepted this tube as a free gift with my Clarisonic (review to follow), score! Now it is my new go-to cleanser. I shall definitely be repurchasing, especially seeing how long it lasts. Sure when I think about it so, on a per usage base it's actually quite economical. To have a gander on the Lancôme website, click here. That's enough cleanser raving from me for today. Until next time, show your skin a lotta love! Ed> sneaky promo for Emer: she has started a new venture called Poppy & Ivy Handmade Crafts. Go across to her Facebook page here if you're interested in taking a look, maybe even give her a Like while you're at it!